I have been working with Dharma and her mother for many months. Her wedding's passing is one of those bittersweet moments I mentioned last week. In this industry we work so hard for so long to bring an event to life. It is often painful when it all comes to a finish. Of course, it is all in how you look at it. Let's just say it is the start of a really wonderful life for Dharma and Andy. 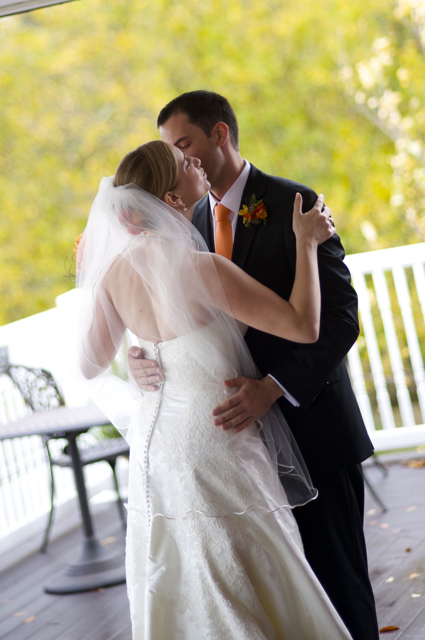 So many things about this wedding were appealing from a design stand point. 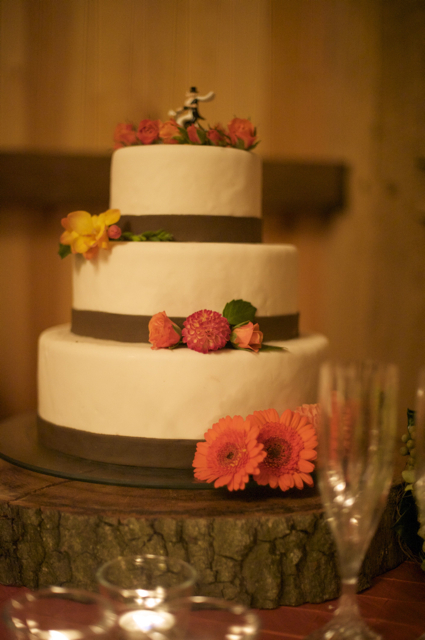 I loved the color combination of brown, orange and green. I loved the natural elements used like moss, twigs and barks. The setting was a huge red barn at Sunset Hills Vineyard in Loudoun County. I also got to work with some amazing vendors. 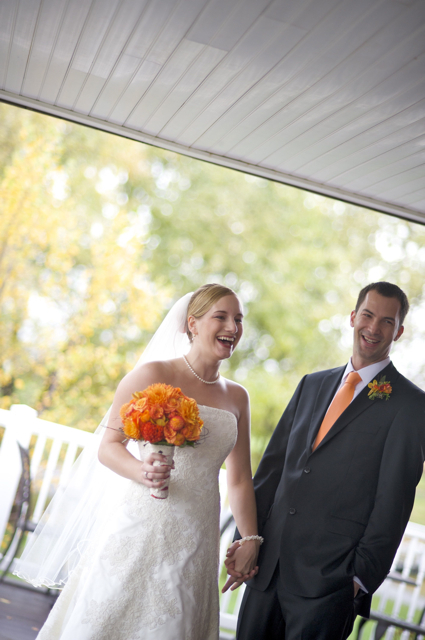 Maria Cooke from Ritzy Bee Events and Maria Vicencio photography. For now the images I am sharing are a gift to us from the bride's sister, Surya. Surya also happens to be a photographer in Colorado Springs, CO. Surya lives and works there with her husband and two children. 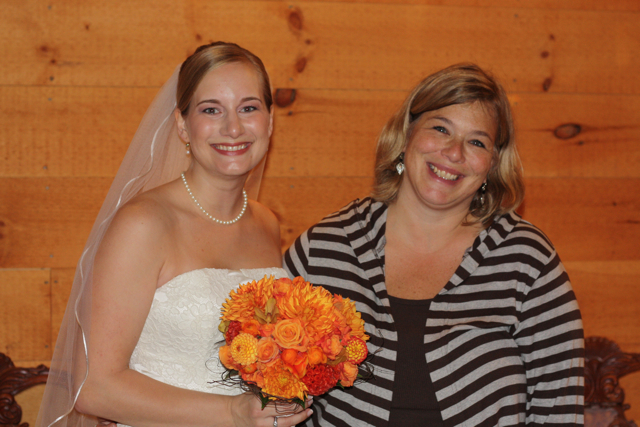 Mostly I loved my bride and her mom, and it is with some sadness I give you Dharma's pictures. Don pulled off one last miracle for me this year by providing just enough Dahlia's to do Dharma's wedding. Thank goodness for a light frost. Thank goodness for Don. 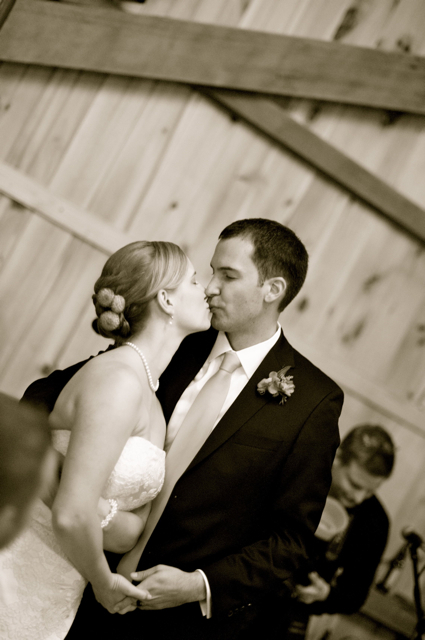 This was the first time we got to use dahlias in the bride's hair. Don grows these amazing little beauties that are perfect for this type of delicate work. I made this really sweet floral crown for our flower girl. Every blossom is individually taped onto the headband. I am not going to admit publicly how long this piece took to make. Let's just say the other designers were wondering if I was ever going to finish. 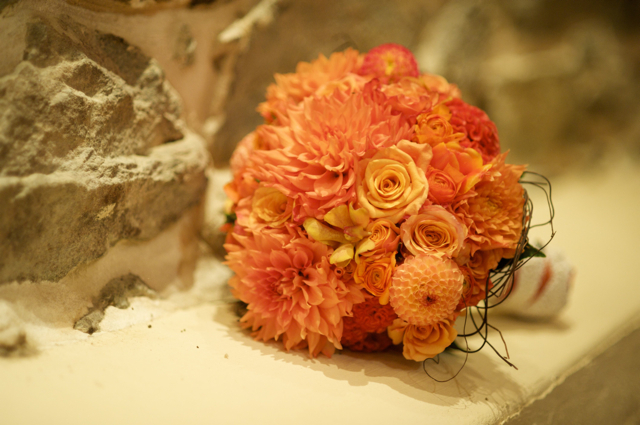 The bridal bouquet was created of primarily Don's Dahlias. I have never actually used this many dahlias in a bouquet. We used large and small dahlias, and getting them all in place proved to be a little difficult. 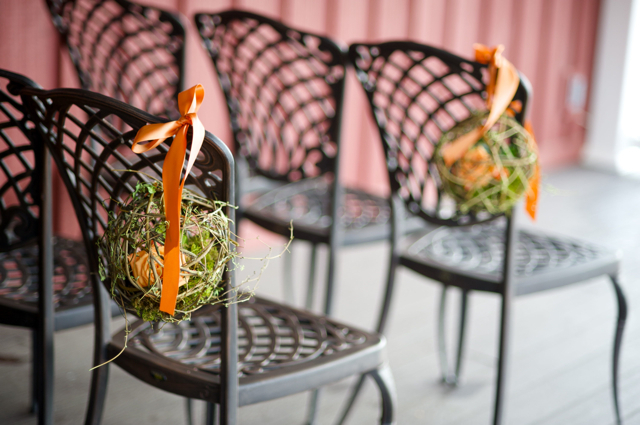 We tied these vine balls onto the chairs to mark family seating. 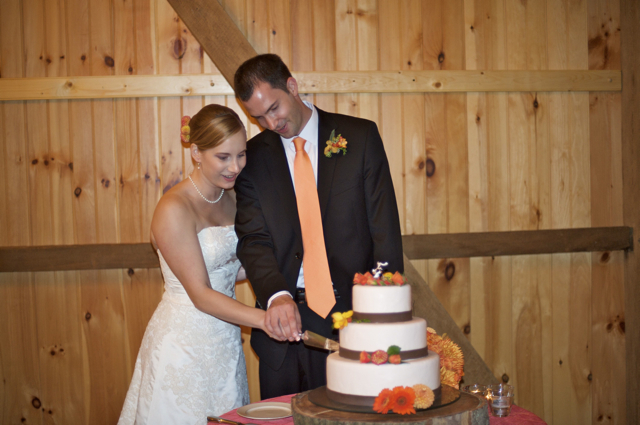 We tucked orange roses and moss into the vine. We designed these arrangements that I absolutely loved. 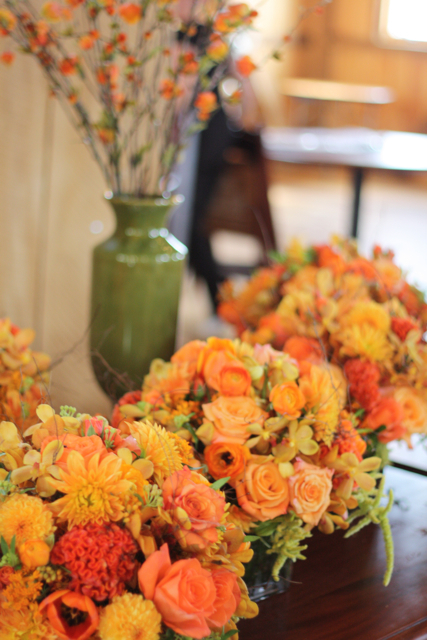 We lined the vase with green moss and did a mass of all orange flowers: orange dahlias, ranunculus, orchids, coxcomb, roses, and tulips that represented the family members from Holland. 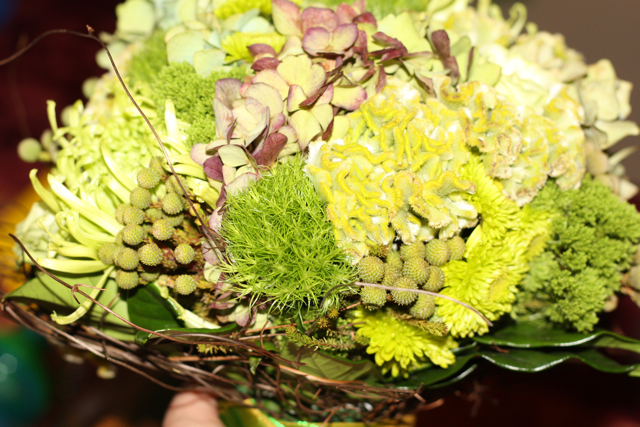 We mixed in brown angel vine and collared the bouquet with green hanging amaranthus. The rest of the pictures in this post were taken by me. Sorry about that, but we still have Maria Vicencio's photographs to look forward to. This was my favorite part of the bouquet. 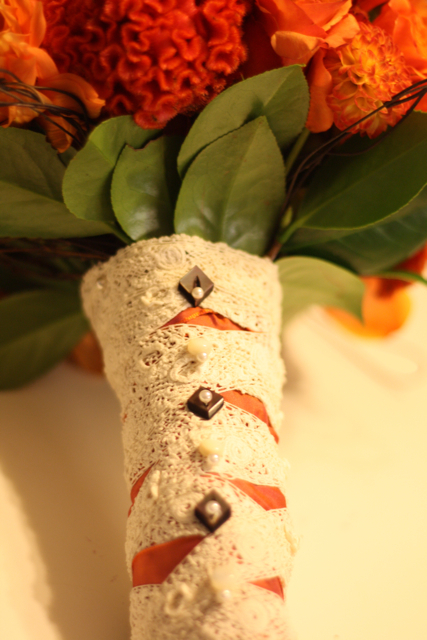 I was given the paternal grandmother's lace and buttons to bind the bouquet. I just loved the final look of this. It was so cool that some of the buttons were brown. 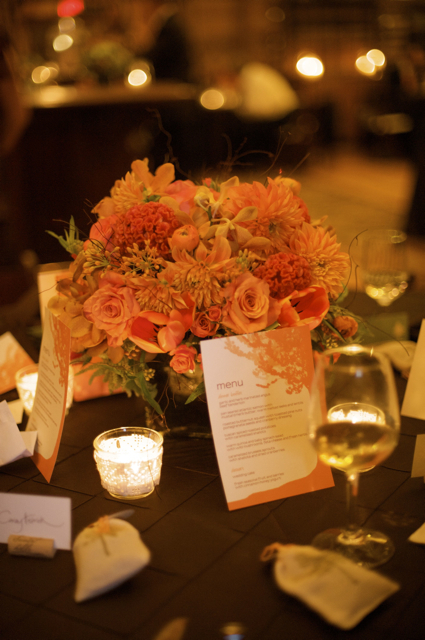 I loved these images of the centerpieces all lined up and ready to be placed. 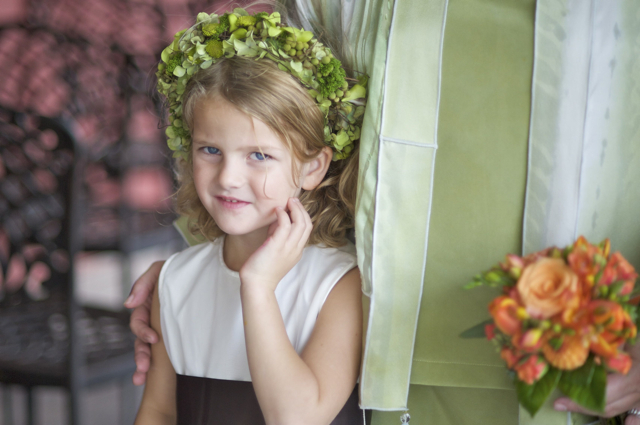 The maids bouquets were clusters of all green with a collar of the brown vine. 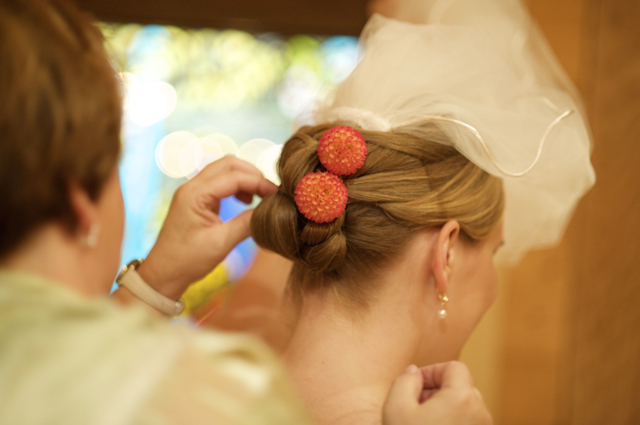 This photo shows the detail in the flower head band. Lots of little tiny blossoms. Today I got to see Dharma's mom. I caught the tears in her eyes as we talked about the wedding. Tears of happiness, of relief, and, of course, some sadness. Bittersweet. When I started in this business, I was the age of most of my brides. I rarely thought about the mothers and how they must feel to watch their baby walk down the aisle. Today I am as close to the mothers age as I am to the brides. I am so sympathetic to the mothers now; I can only imagine what it must feel like to help your daughter prepare for her wedding. Happy married life Dharma; we loved your wedding.